Use code 'hkd500' for INR 500 off per person. Valid till September 30 only! The Har ki Dun Valley is one of the most beautiful regions in the Garhwal Himalayas, and attracts trekkers from around the world. The trail winds through apple orchards and pine forests, and takes you up into green valleys dotted with flowers and criss-crossed with sparkling streams. You'll be able to see famous peaks like Banderpoonch and Swargarohini while you trek. The Har ki Dun trek is not a challenging one, and has very few steep sections, so can be done by fit beginners or families with children over 9 years. However, it involves about 5-6 hours of walking each day, so you should be prepared for that. You'll spend days walking through gorgeous landscape, and evenings around campfires under starry skies. At night, you'll camp in cosy tents set up in alpine meadows, with the snow-capped mountains around you. This trek to Har Ki Dun takes you to a cradle-shaped valley enveloped with the most magnificent peaks in the Garhwal Himalayas. You’ll find yourself walking through green mountain meadows scented with wildflowers and trek to Hata Valley for scenic views of the Hata and Jeju peaks. These six days will be memorable, not just for the breathtaking landscape, but for the wholesome outdoorsy experience as well. The crisp mountain air sharpens your appetite for our delicious hot meals, and you’ll sleep like a baby in your tent every night. Any costs arising from unforeseen circumstances like landslides, bad weather or roadblocks, etc. Har ki Dun is one of the best loved trekking routes in Uttarakhand, and attracts adventurers from around the world. It offers trekkers a chance to walk through the protected habitat of Govind National Park, where dozens of species of flowers and trees abound. There are apple orchards, green valleys, wildflowers, and streams everywhere, and you'll be camping in open meadows with sweet grass under you. The trek to Har-Ki-Dun valley is mix of peaceful walks, and adventurous ascents. It offers stunning views of the surrounding peaks and glaciers in the Banderpoonch range. IMPORTANT: A minimum group size of 4 pax is required to make the booking. Har Ki Dun, which translates to Valley of the Gods, is one of the least explored places in the Garhwal region. This is not a difficult trek, but it has some long days of trekking, so you should be aware of that. You'll be trekking alongside rivers, crossing gorgeous meadows and forests, and camping at stunning locations. One of the highlights of the Har ki Dun trek is the views all around, and you'll get plenty of time to enjoy the views on this 7 day trek. The Har Ki Dun trail is one of the most gorgeous treks in the region. It winds upwards gently, taking you through dense pine forests, with greenery all around and distant mountain peaks that glitter in the snow. During the winter, snow covers the landscape around, creating an icy paradise. This trek leads upwards and has challenging steep gradients in some sections, but is suitable for beginners as well as experienced trekkers looking for a snow trek. This 8-day snow trek to Har Ki Dun takes you through some of the most scenic locations in the Garhwal Himalayas. You'll see sprawling meadows, alpine trees with branches weighed down with snow, and towering mountains all around. This Har Ki Dun trek will be memorable, not just for the breathtaking landscape, but for the wholesome outdoorsy experience as well. The crisp mountain air sharpens your appetite for your delicious hot meals, and you’ll sleep like a baby in your tent every night. Any costs arising from unforeseen circumstances like landslides, bad weather or road blocks, etc. 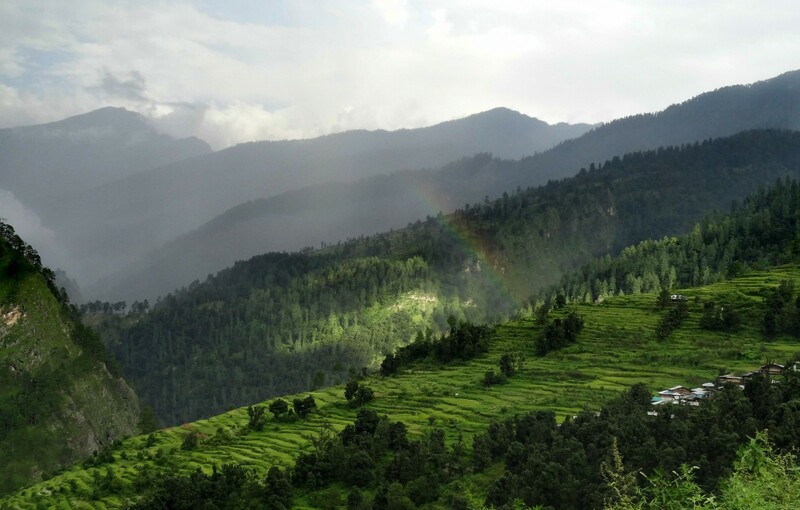 The trek from Hari ki Dun trek is not a difficult one, and is suitable for fit beginners and for experienced trekkers. While it isn't technical in nature, there are some days of long trekking hours, so you should be prepared for that. The Har ki Dun trek leads you through some of the most gorgeous scenery, and some of the most isolated villages of India. The trail takes you over a ridge in a gradual ascent, offering you spectacular views that grow wider as you trek upwards. You'll camp in the Har ki Dun valley, and also get a full day to explore the best parts of this beautiful landscape.